They said that the reasons were security, encryption and OTA updates. They also added that Z-Wave was fine for simple applications, etc. Some, as we think, also commented that they expected to be incorporated in Z-Wave. In this line, for example, walks another domotic initiative most renowned, home automation gateway, controlled from your smartphone, and wireless sensors and actuators. At International CES 2013 we knew that Smarthings will support both Zigbee and Z-Wave. From Smarthings and its initiative to capitalize via Kickstarter we had heard some time ago. Which wasn’t expected at this event was the Almod+. Almond+ is a small router launched last year, which has become in less than three months a number one product in its category on Amazon U.S. For $79 provides an interesting range of functionalities and also has a front panel touch screen to manage these options without a PC. Some journals already have dubbed as the next generation router. The company Securifi has surprised us with a new very interesting model: Almond+. On one hand, they have evolved the router itself, with 4 Gigabit Ethernet connections to and WiFi 802.11ac (1.17Gb/s! 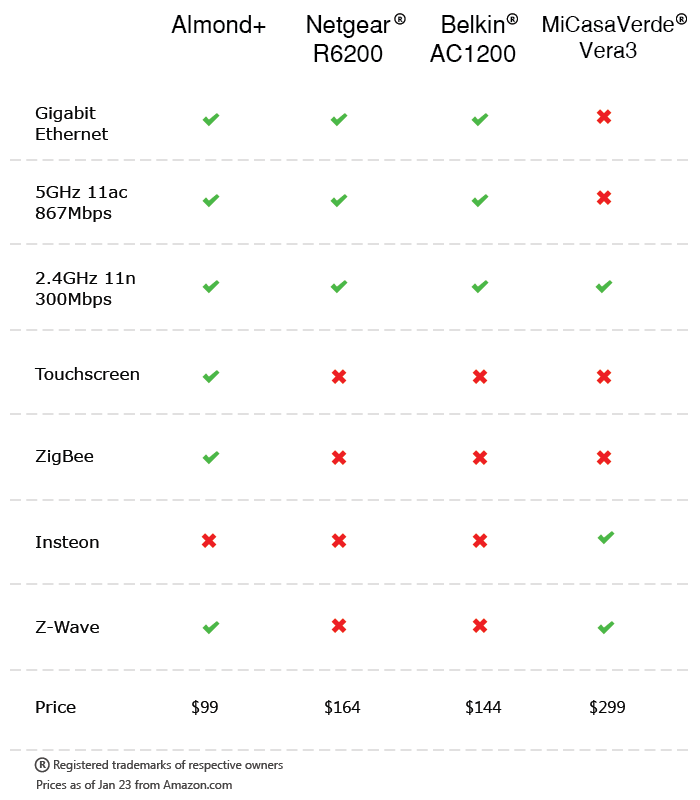 ), what makes it as one of the fastest routers at the moment. Of course, with the usual functions of the routers in this range: firewall, port forwarding, QoS, VLAN, DMZ, etc. On the other hand, and here’s the kicker, Securifi decided to integrate home automation modules with support for Z-Wave and ZigBee. So, the house can be controlled from the touch screen of the router or via a mobile app (iPhone and Android in progress). Finally, the biggest argument: a price of only $99, so it is a very convenient router, but also with a minimum price as home automation Gateway! Well, even if they are compatible with Z-Wave and ZigBee, it is still not availabe to go deeper in some details to see what the softwareand platform are capable, which is really what can make differences in terms of other proposals like home automation. Right now Almond+ is another Kickstarter project, without any doubt that funding will achieve its goals: it has accumulated more than $200,000 of the $250,000 needed, and there are still 30 days left. If you like it, even if the automation does not convince you, it will be a very good router for a reasonable price ($129 for the special version of “Pearl” + $30 for shipping outside the U.S.). Delivery scheduled for September, we will have to wait and be ready.